Mom and I had a marathon baking day yesterday – 700 cookies later and I’m still tired! Only ONE week til Christmas!!! One more dessert to make, and a few more presents to buy. I am READY! While baking, lounging and making gifts I’ve been soaking in the Christmas music and Holiday movies (mostly on Lifetime). 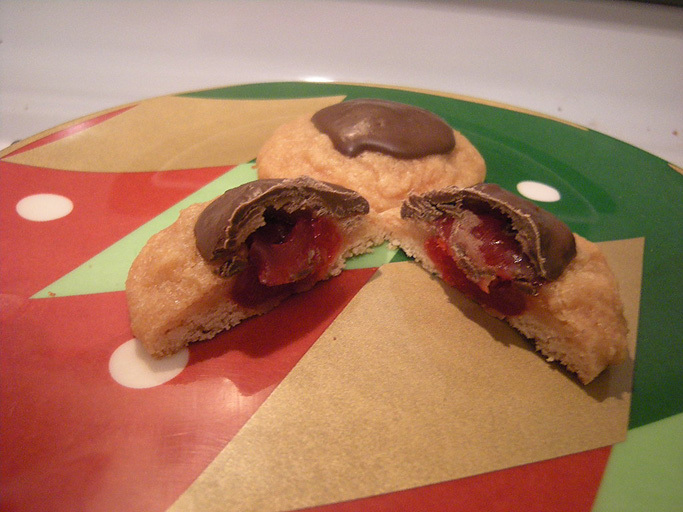 One of the new recipes I tried this year was a Chocolate Covered Cherry Cookie. I really like them! I haven’t shared them with anyone else, so perhaps the verdict is still out on this one. But I call it a success. Pat cherries with paper towels to remove excess moisture; set aside. In a large bowl, cream butter and brown sugar until light and fluffy. Beat in cherry juice and vanilla. Combine flour and salt; gradually add to creamed mixture and mix well. Cover and refridgerate for 1 hour or until dough is easy to handle. Insert a chocolate chip into each cherry (there should be a nice cut from where the pit was removed). Wrap a tablespoon of dough around each cherry. Place 1 in apart on ungreased baking sheet. I recommend following the directions on the tablespoon of dough – I didn’t follow that exactly because I accidently doubled the recipe. Mine was more like… two tablespoons. I also found it incredibly hard to “wrap” the dough around the cherry. So I mostly the scooped the dough onto the pan, then pushed the cherry into it and just kinda pulled the excess around the top. Bake at 350 for 15-17 minutes or until set and edges are lightly browned. Remove to wire racks to cool. In microwave, melt remaining chips and shortening; stir until smooth. Feel free to add more chips and shortening, these recipes never call for enough frosting. Dip tops of cookies in melted chocolate OR just spoon the chocolate on to cookie. Let stand and eat. Next up is another ball, just for my sister-in-law, Leah. She has some fascination with balls. Says she could eat them for breakfast, lunch and dinner. She likes Christmas with our family because we always have ham balls, and now Oreo balls and Peanut Butter balls. So Leah, this one is for you! 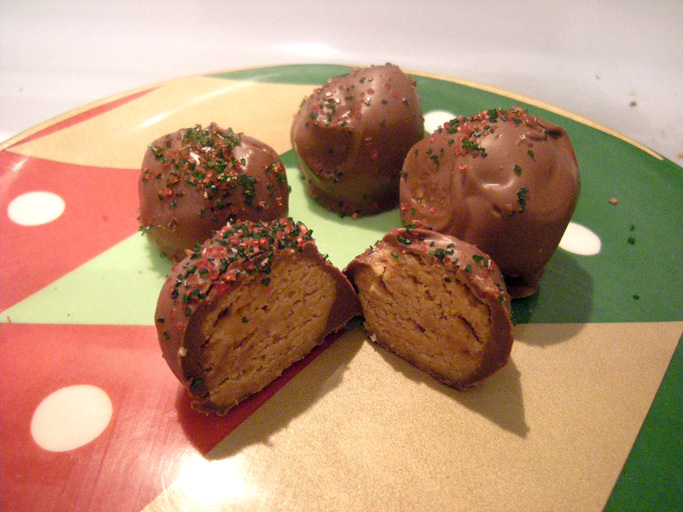 Directions – You have two options – you can make these into balls, or just spread in a pan and eat as bars. Grandma made them into bars. Also, you might as well double the recipe now, because it’s flawless and you will love it. Mix butter and powdered sugar, mix in peanut butter, then graham crumbs (if you are making the balls, don’t use a full cup of graham crumbs – just a little less will let you roll the balls easier) . Put out some parchment paper or tinfoil on the counter or a cookie sheet, someplace for your balls to dry. Roll into about 1 in balls, set aside. You will need the chocolate bark for the balls, the chocolate chips just wont set up enough. Melt the bark according to directions – as always, follow the directions so you don’t burn it! Dip the balls into the chocolate. As I was putting the balls into the chocolate and removing them with a spoon, my mom suggested using a fork – it allows the excess bark to drip off before it gets to the pan. GREAT idea, as usual! Allow balls to dry, then eat and package! 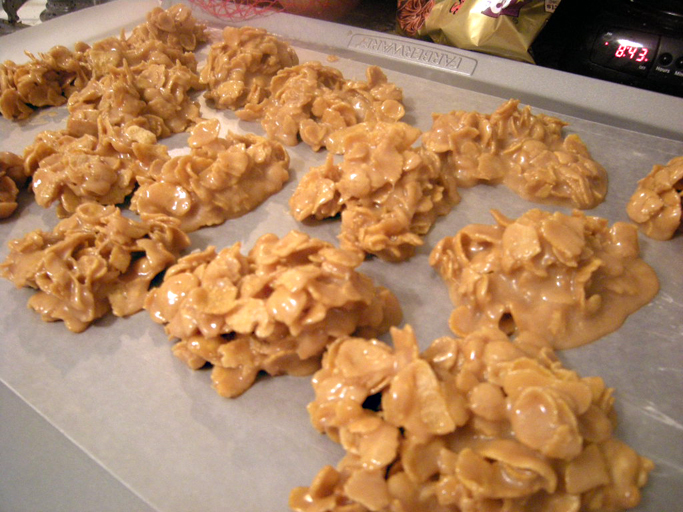 Spread mixture in 8×8 pan. Melt chocolate chips and spread over mixture.